Last night we spent the evening out on the lake. It was a gorgeous night for a leisurely boat ride around Lake Red Rock. My hubs picked up a boat for cheap last summer, and he's been fixing it up. So last night my sister and I decided to meet up for a picnic then go out on the boat. It was a great time! However, I realized during the picnic that I haven't posted a chocolate chip cookie recipe for months! What is my deal? I've been making them, that's for sure! If you haven't checked out my Jumbo Peanut Butter cookie post, you should do that now. 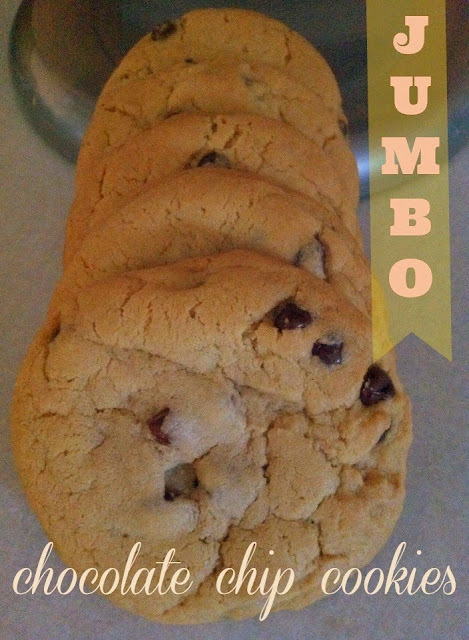 Between that cookie and this cookie, I have realized that the hubs just enjoys jumbo cookies. This one is now a favorite of his, much like the Jumbo PB cookie. If you have been following my chocolate chip cookie adventure, you'd know that I have difficulties baking the best chocolate chip cookie. Well, this one blows all the cookies out of the water. These bake up big and beautiful. 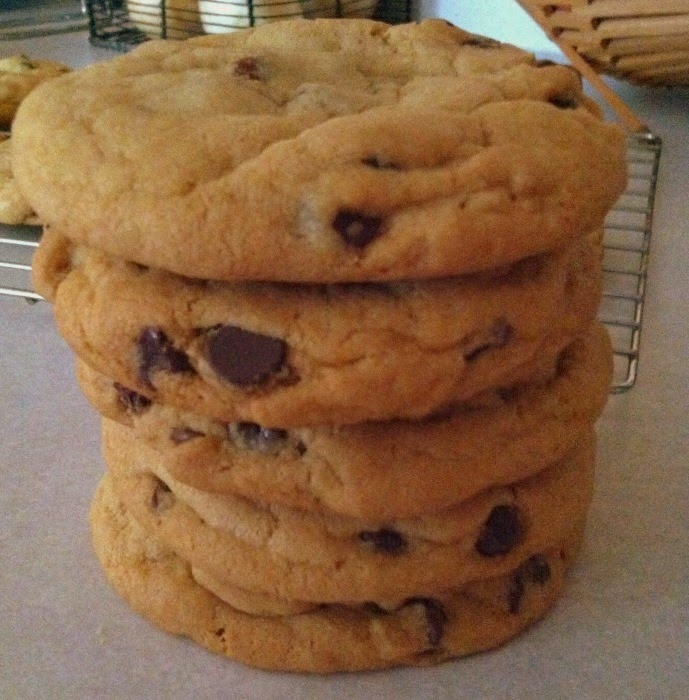 This recipe creates 18 wonderfully jumbo chocolate chip cookies. 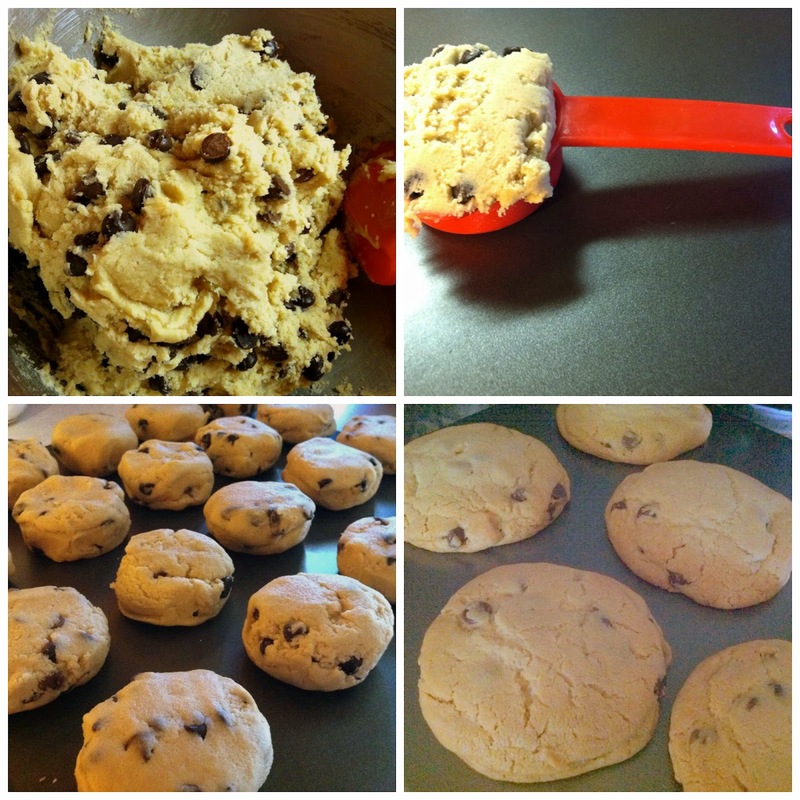 Use a 1/4 cup measuring cup to portion out the dough, shape the cookies, and pop them in the freezer for a bit. I also lowered the baking temp on these to 325, because the last couple times I made these I baked at 350, from the recipe I found here, but they turned too brown and crispy, and I didn't feel like these cookies were meant to be that way. In a stand mixer, cream together the butter, shortening and sugars for 2 minutes or so. Add the eggs and vanilla to the butter mixture and combine well. Whisk together the flour, baking soda, salt and cornstarch together in a separate bowl. Slowly add the flour to the creamed sugar mixture. Mix just until the flour is incorporated. Remove from the stand mixer and fold in the chocolate chips. Place the dough on a cookie sheet and place in the freezer for about two hours. Place 6 frozen cookie doughs on a cookie sheet at a time. Bake for 15-20 minutes, until the centers puff and the edges are slightly browned. Remove from the cookies from the oven and let sit on the cookie sheet for 5 minutes or so, until hardened enough to move to a cooling rack to finish cooling. Bake as many as you'd like, keeping the dough frozen and covered if going to be longer than two hours.